Sanei Sangyō K.K. (三栄産業㈱) was a Japanese camera maker. It made cameras under the Samoca brand from 1952. It was renamed to Samoca Camera K.K. (サモかカメラ㈱, Samoca Camera Co., Ltd.) in 1955. Samoca cameras and accessories were distributed by Hattori Tokei-ten at least until 1956. 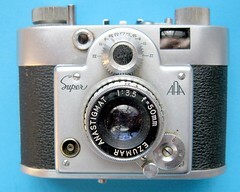 The company was perhaps renamed Sanei Sangyō again in 1958, and Samoca cameras are known at least until 1962. The logo of the company consisted of AAA inside a triangle; the three "A" are certainly inspired by the company name "Sanei", which can be phonetically understood as "three A" in Japanese. Samoca 35 II viewfinder model. 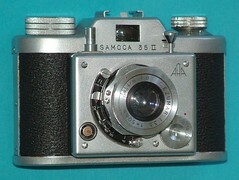 Samoca 35 rangefinder model. Photo Art no.80, June 1955. Shashin Kōgyō April 1956. ↑ Advertisements reproduced in Kokusan kamera no rekishi, p.139, show "Sanei Sangyō" in February 1955 and "Samoca Camera" in May 1955. ↑ Advertisements reproduced in Kokusan kamera no rekishi, pp.139 and 252. ↑ Attribution of the Samoca cameras in Kokusan kamera no rekishi, p.388. ↑ The Romanslide Z is announced as a new model in the advertisement on p.124 of Photo Art no.80, June 1955. ↑ 5.0 5.1 5.2 Advertisement on p.124 of Photo Art no.80, June 1955, and advertisement in Shashin Kōgyō April 1956, p.237. Photo Art rinji zōkan: Kamera akusesarī zensho (フォトアート臨時増刊・カメラアクセサリー全書, Photo Art special issue: All the camera accessories). June 1955, no.80 of the magazine. Advertisement by Hattori Tokei-ten on p.124. Shashin Kōgyō April 1956. Advertisement by Hattori Tokei-ten on p.237. This page was last edited on 22 September 2017, at 05:12.